Jon Lord’s Concerto for Group and Orchestra will celebrate it’s 50th anniversary this fall with a Canadian premiere. 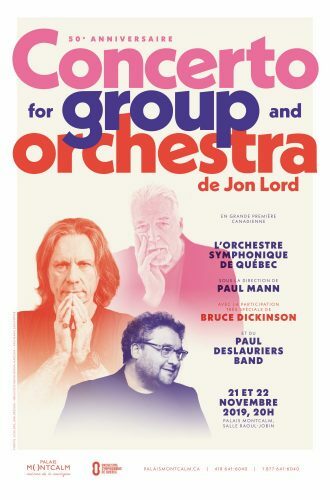 Orchestre Symphonique de Québec, conducted by Paul Mann, with special guest Bruce Dickinson on vocals, Paul DesLauriers Band, and Pierre Bélisle will perform it at the Palais Montcalm in Quebec City on November 21 and 22, 2019. Tickets for the first show went on sale today and apparently sold so well (seat capacity: 962) that the second show was added immediately. Posted by Nick Soveiko on Thursday, April 11th, 2019, filed under News. You can follow comment on this post through the RSS 2.0 feed. You can skip to the end and leave a comment. Pinging is currently not allowed. Hope the show is recorded! Jon’s been gone for approx 9 years but his music will live on forever! I hit the wrong button. Jon’s been gone approx 7 years. The sound of his Hammond on the album “Purple Passages”, the first DP album I bought, was what got me hooked on Purple. The next album I bought was “Made in Japan” and I was blown away!! MKII, followed by MKI, are my 2 favorite line ups but they all are great! @ 1: Jon died in 2012, so it’s 7 years. As A Canadian. This makes me proud. I hope Jon will be watching. Awesome! Now make your way to TORONTO next! @ 2: I hear you, bro. I had a similar experience. My father bought a new car and wanted to proudly demonstrate the stereo sourround system which was indeed impressive. He put on the “Deepest Purple – The Very Best Of”. I believe it was the very first best-of ever released on CD some time in the 80ies. Speed King, Child in Time, Black Night and Burn were my favorites – funnily enough not Highway Star. I couldn’t stop listening to the guitar solo in Child in Time. To this day I think it’s the best guitar solo ever recorded. But in fact, I had to know which organ was used for the intro. I had this sound in my head my entire life but I didn’t know how the instrument was called and nobody could help me. By coincidence, I told a fellow guitar player about my experience with said Purple CD and he instantly told me that Jon was playing a Hammond C3 through Leslies or a Marshall Major. From that moment on I was addicted to the Hammond and Jon’s playing always was very inspirational to me. IMHO, Jon played on of his best Hammond solos within the first movement of the original recording of the Concerto. I always wait for that moment when I listen to the Concerto of 1969. However, the most touching solo Jon ever played in his life was at the end of the second movement of the studio recording. It expresses the situation he was in very well, shortly before he passed away. It makes me sad everytime I hear it.